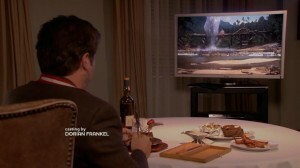 Parks and Recreation is currently my favorite TV show. In season 3, episode 12, Leslie throws Ron a surprise birthday party. 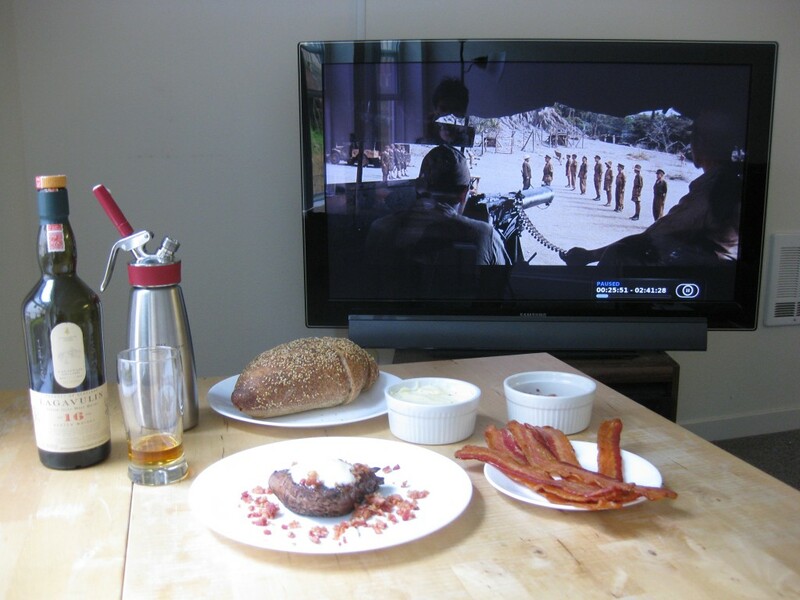 It’s a solo dinner consisting of an enormous porterhouse steak, a plate of bacon, a bottle of scotch and The Bridge on the River Kwai. The scotch is easily recognizable as Lagavulin 16 from the label. 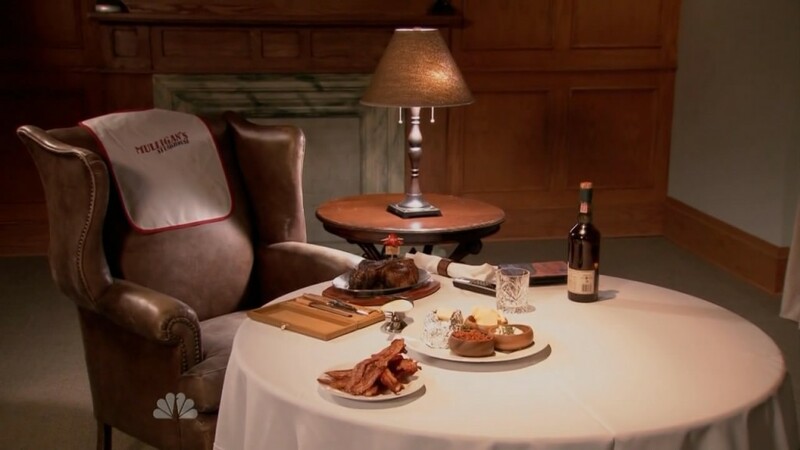 Ron has also had Lagavulin at Charles Mulligan’s Steakhouse. I decided to recreate Ron’s birthday dinner using modernist techniques. 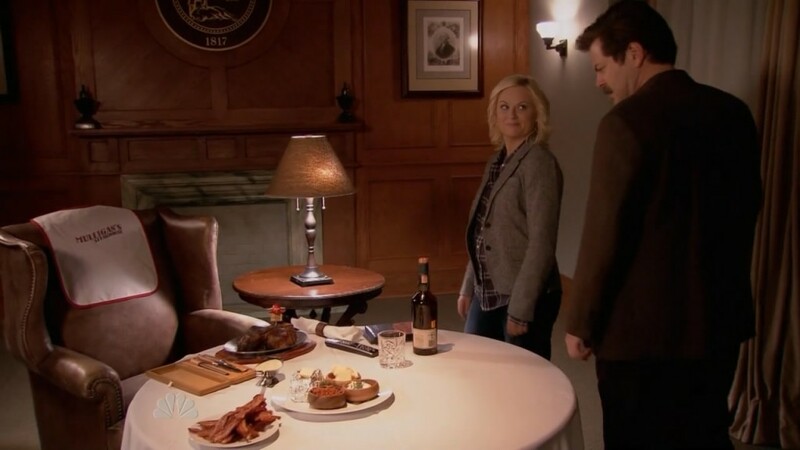 While modernist cuisine is more Tom Haverford than Ron Swanson, I think the combination of beef and scotch is manly enough for Ron. Here’s how I made it. 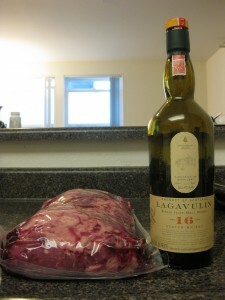 First, start with a whole PSMO beef tenderloin and a bottle of Lagavulin 16. A whole beef tenderloin is cheaper (about $10/lb at Costco) than individual cuts of filet mignon and it will allow you to cut the steak as thick as you like. I chose a filet instead of Ron’s porterhouse because a porterhouse would not fit in my tiny, sous vide magic controlled 4 cup rice cooker. Trim the chain and side muscle from the main tenderloin muscle. Set the side muscle aside, then salvage what meat you can from the fatty chain. 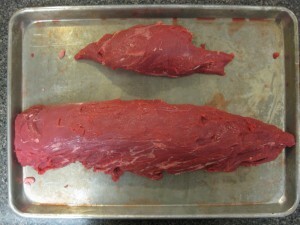 Scrape the silver skin off of the main muscle, leaving the trimmed tenderloin and side muscle shown below. 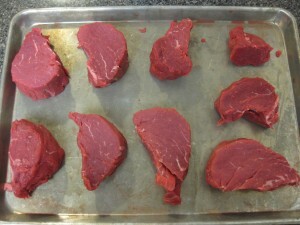 Cut the main tenderloin muscle into individual steaks. 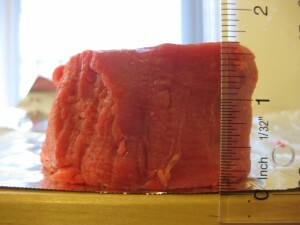 I cut the steaks 1.5-1.75 inches thick. They weighed 6-8 oz each. Place each steak into a vacuum sealer bag. Add 1.5 oz of scotch to the bag (I measured using a jigger). Seal the bag in a chamber vacuum sealer. 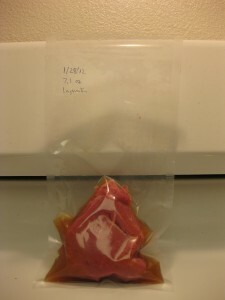 A chamber vacuum sealer is the only way to seal the liquid inside of the bag. Place the vacuum bag in the fridge and let the filet marinate in the scotch overnight. 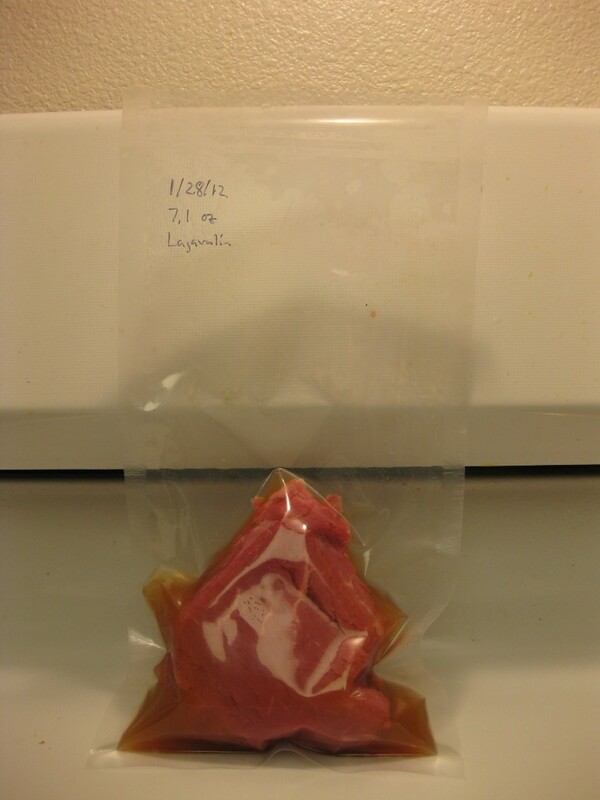 The next day, place the sealed bag into a 55 dec C sous vide water bath to cook it medium rare. The cooking time depends on the thickness of the steak. While the steak cooks, start making the bacon. 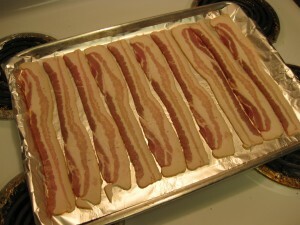 Baking is the easiest way to cook large amounts of bacon. 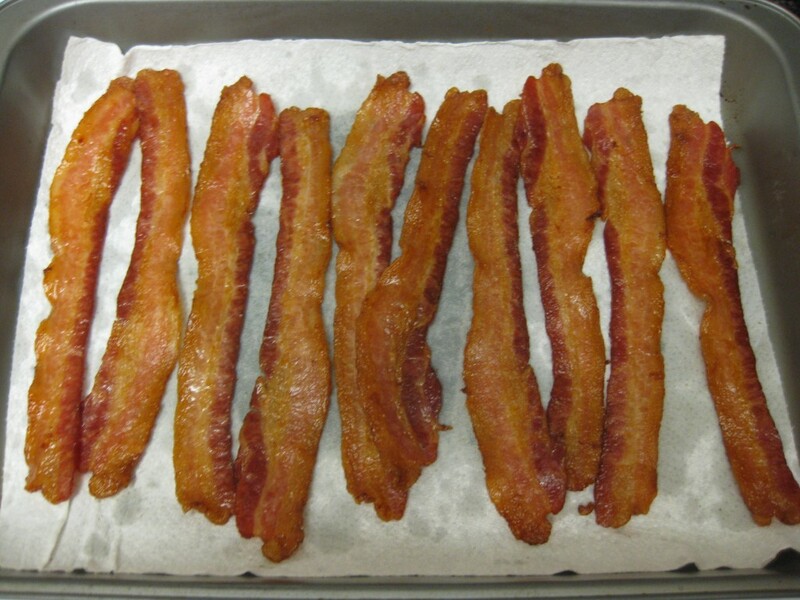 Line a tray with tin foil, cover it in bacon and place it into an oven set at 400 deg F. Cook the bacon until crispy, flipping once as necessary, about 30-40 minutes for thick cut pieces. The steak is in the water bath, the bacon is in the oven. Time to get started on the butter. 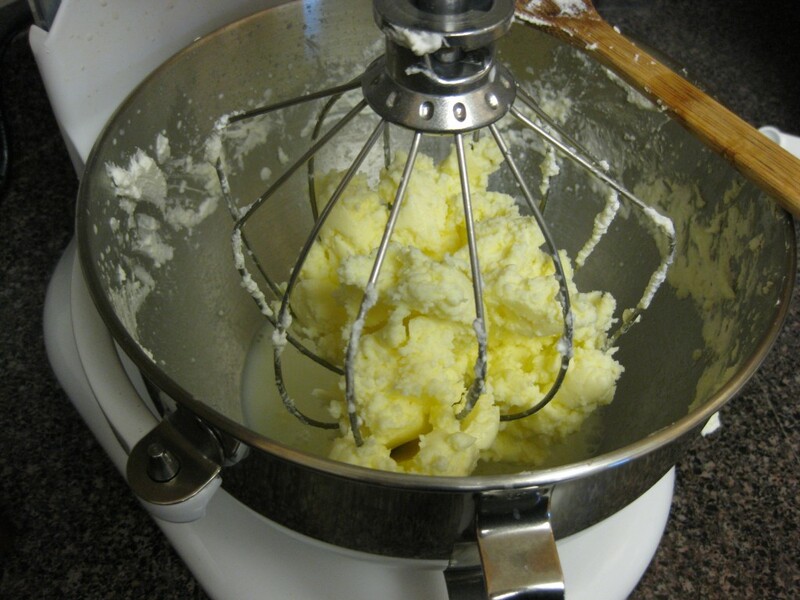 We’re going to churn fresh butter in a stand mixer. 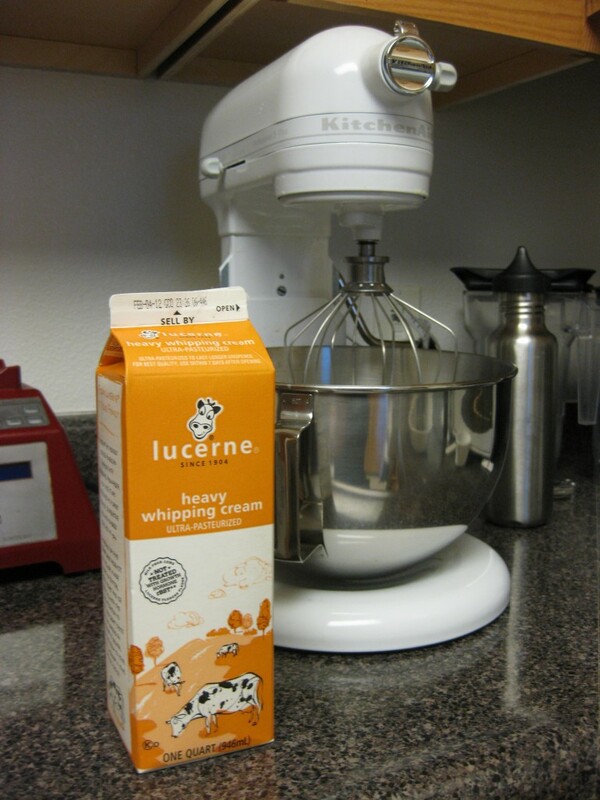 Start with 3 cups of heavy cream. 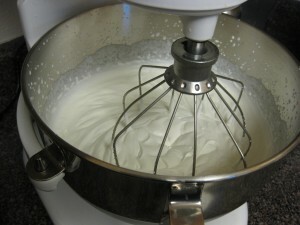 After a few minutes of whisking in the mixer you’ll have whipped cream. 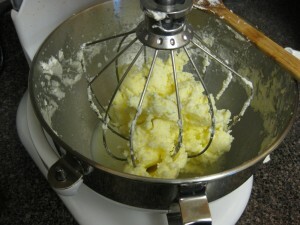 Continue whisking and eventually butter will separate from the buttermilk. It’s a sudden transition. 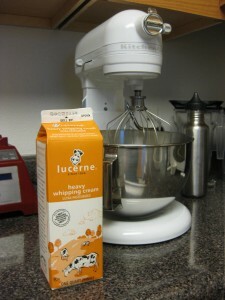 Pour out the buttermilk and squeeze as much liquid out of the butter as you can. Next, melt 100 g of butter in a water bath at 104 deg F. I do not have a second immersion circulator (yet! 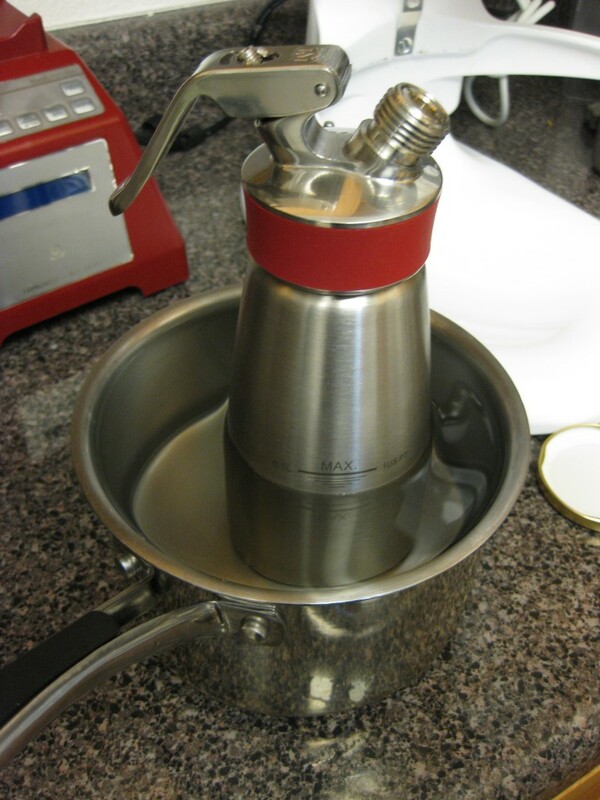 ), so I jury-rigged a double boiler with a pot inside of a pot with 104 deg F water from the sink. Mix in 1.5 g of black truffle salt to make salted truffle butter. Pour the melted butter mixture into an iSi whip and charge with a N2O charger. 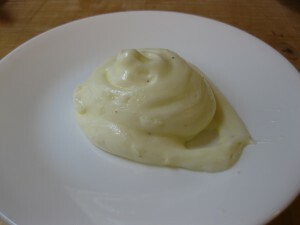 Here’s what the butter looks like after dispensing with the whip – it’s fluffy and a lot lighter than normal butter. Place the whip into a 104 deg F water bath to keep the butter melted until everything is ready to be plated. Ding! 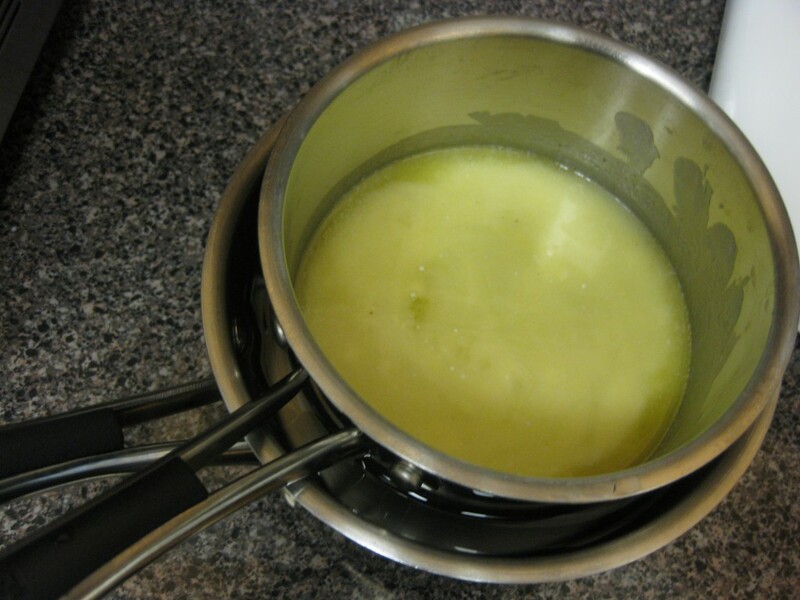 The bacon should be done fairly soon after you finish the butter. Place it on a towel to absorb the grease. Put a few strips into a food processor and chop them into bacon bits. Reserve the strips and bacon bits for later. Butter is ready, bacon is ready. Go set up the movie. 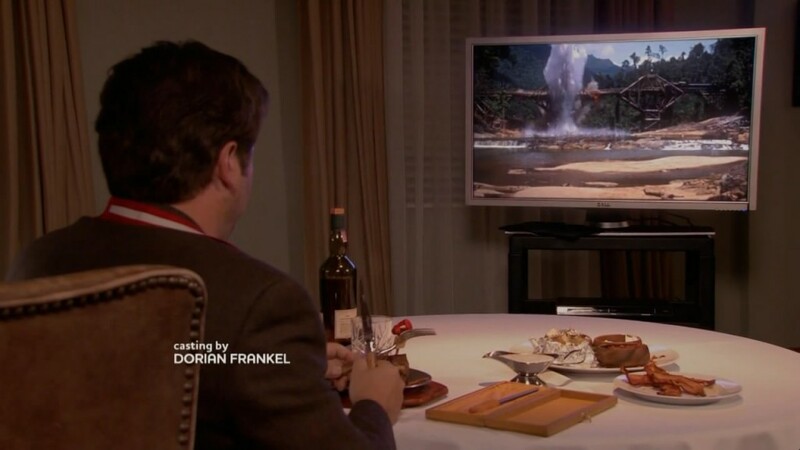 By the time you finish setting up the movie the filet should be just about done. 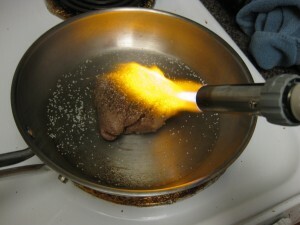 Take the steak out of the water bath, cut open the bag, and place it on a frying pan. Season with kosher salt and pepper. We’re going to finish this steak by searing it with a butane torch. Playing with fire is fun! Time to plate! Place the steak in the center of the plate, sprinkle with bacon bits, dispense the whipped truffle butter on top of the steak using the iSi whip. Cooking is complete. Slice some freshly baked sourdough bread from Arizmendi Bakery. Pour yourself some Lagavulin. 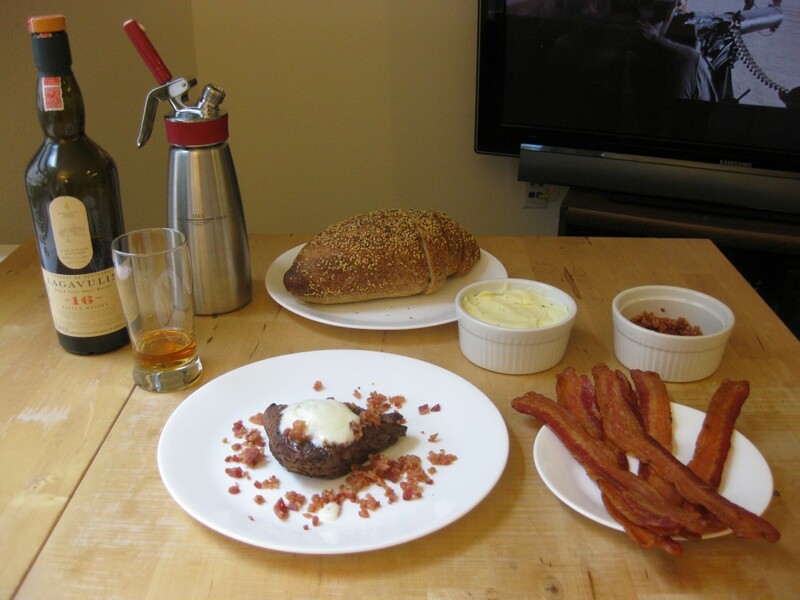 Side dishes include bacon slices, bacon bits, truffle butter and whipped truffle butter. 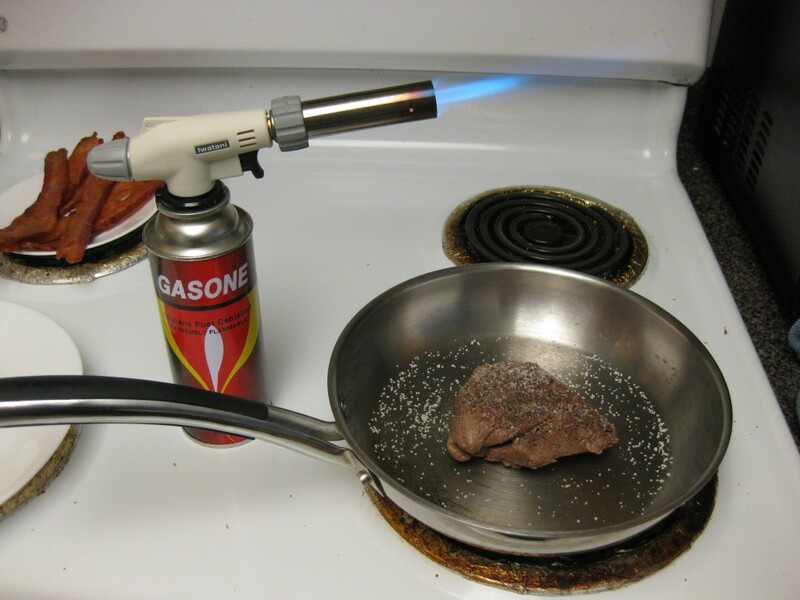 Filet mignon vacuum marinated in scotch is delicious. Cooking sous vide means it’s done a perfect medium rare; tender and juicy. The alcohol is also sealed in the plastic bag while it cooks, so it can’t evaporate. 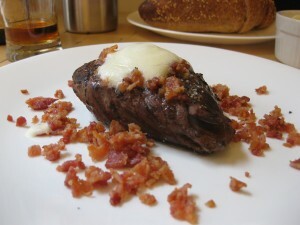 The peaty flavor permeates the steak. And each bite stings the mouth a little bit, just like drinking scotch. Stinging steak is definitely a novel sensation. It’s truly a man’s steak. It’s awesome! 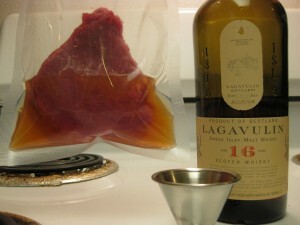 I also made this filet with Laphroig 10 instead of Lagavulin 16. Laphroig was much smokier (as it should be), but it didn’t have any of the sting. I marinated the Laphroig in the bag for a few hours instead of overnight, so maybe that’s the difference. I also used less Laphroig, although I didn’t measure it. I still have to try Glenlivet 18 (the last bottle of scotch I have), which I expect will pack Lagavulin’s sting, but none of the smokiness. For now, Lagavulin is the best.